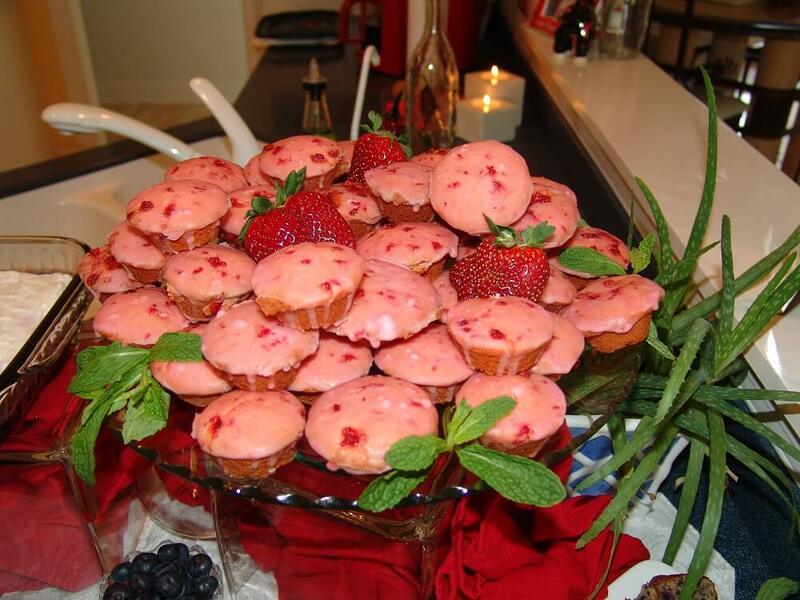 If you were serving these at a party, I would garnish each one with a slice of strawberry and a sprig of fresh mint. Spray miniature muffin tins with cooking spray. Combine the cake mix, eggs, vegetable oil and strawberry Jell-O with an electric mixer until smooth. Spoon the batter into the muffin tins, filling each muffin tin half way full. Bake for 12 minutes. Turn out onto a cloth or cooling rack. While cakes are cooling, make your icing. Mix the Kool-Aid with 1 cup of water. Add to the confectionary sugar. Add oil and strawberries. Stir until smooth. Dip the top of each cake into the icing or drizzle with the glaze. Let glaze set.